Fifteen-year-old Jason Pavila celebrates with his leaders after winning his rookie Bogus Creek 150. 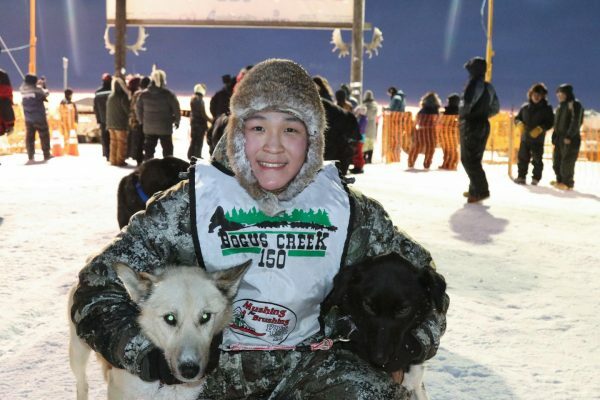 In the Bogus Creek 150, the youngest musher took first place, beating the oldest racer in the field by just a few minutes. At 9:37 Saturday morning, a fifteen-year-old boy was the first musher to enter the race chute on the Kuskokwim River. Jason Pavila of Kwethluk and his nine dogs won the Bogus Creek 150 on his first attempt. Pavila is so young he needed permission to race. He entered at the urging of his father Lewis Pavila, a race veteran. This was the younger Pavila’s first time going all the way to Bogus Creek with a dog team, something that, at first, gave him pause. “[I was] scared, nervous, but when I got into the race it was fun,” said Pavila. Jason Pavila brings home $8,775 from a race purse of $60,000. He didn’t know he was in the lead until the final miles of the race, when a spectator along the trail told him he was leading. Running the dogs from his grandfather Max Olick’s Mad River Kennel, Pavila bested a field of veteran mushers. Chasing him was a past champion, George Manutoli, who last won this race in 1998, six years before Pavila was born. Pavila ran right behind the elder Manutoli on the trail upriver to Tuluksak and Bogus Creek, watching him for the first half of the race. “Yeah, I stayed behind him going to Bogus Creek to learn a little bit, to pace my dogs and see what he does,” said Pavila. At the Bogus Creek halfway point, Pavila camped for four hours of mandatory rest and fed his dogs a meal of whitefish and chicken. Then, he took the lead running downriver to Bethel. “Hard to get rid of him,” said Pavila. Manutoli drove the Glare Ice Kennel team to a second place finish a little more than 8 minutes after Pavila. Surrounded by friends and family, Manutoli said it was a hard, fast trail with good weather overnight. “Warm for a change,” said Manutoli. Not long after, Nik Wikstrand arrived in third place. Originally from Norway, Winkstrand handles for Pete Kaiser’s kennel. A wrong turn on the way up-river was an early setback for him. In fourth place was Cameron Jackson of Akiak.